The placenta is an organ that forms during pregnancy. It is attached to the uterine wall and provides nourishment and oxygen to the baby. In about one percent of pregnancies, the placenta peels away from the wall of the uterus in what doctors refer to as placental abruption. The severity of placental abruption varies, from partial nonthreatening detachment to complete separation from the uterus. Because the growing baby relies on the placenta for nutrients and oxygen, the abruption of the placenta can have devastating effects. The greater the separation between placenta and uterine wall, the greater the risk for birth injuries. Vaginal bleeding is not a definitive sign of placental abruption condition, but it is a symptom. 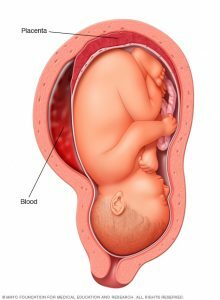 The amount of bleeding can vary and does not necessarily denote the severity of the abruption because some of the blood might be trapped behind the placenta in the uterus. Back pain and abdominal pain are frequently associated with placental abruption. The uterus might feel especially tender or sore. A combination of this pain and vaginal bleeding is a sure sign to contact a medical professional immediately. A placental abruption can leave both mother and child severely damaged. Failure to diagnose placental abruption and deliver the baby before brain damage occurs may be grounds for legal action. Thurswell Law’s experienced attorneys will fight for justice for those who have been affected by malpractice related to placental abruptions. Call Thurswell Law today for a free consultation at 248-354-2222.